It’s not a particularly sophisticated argument so I don’t think I need to extrapolate on its meaning. But even though I am a self-publisher, even though I can see what it’s getting at, as soon as I saw this I immediately heard in my head all the arguments that readers throw about when talking about writers that go it alone. 1. Some indie books undoubtedly did take two years to create. Maybe even longer. For every one of these, though, there are probably four or five that were cobbled together in days or weeks. 2. Your cup of coffee may well be gone in fifteen minutes, your book would last you longer. Having shopped at Starbucks before though, you’re pretty sure of what you’re going to get. They have quality control as an embedded part of their production process. The next drink you buy from them will taste just like the last one, and the one before that. You may end up wishing the book you bought would self-destruct in fifteen minutes and take the part of your brain that remembers the awful plot and characters with it in the explosion. 3. The coffee didn’t, in fact, take a minute to make. It took ages. Because someone, somewhere, was growing coffee beans in a controlled environment, using years of experience in how to do that effectively. Then there was a drying process, a logistics process as the beans were carted about the globe. There was a process where Starbucks refined how to turn the ingredients into something palatable, and specifically formed/blended/whatever. I’m labouring the point, I know. I’m not trying to make an argument on free market economics. I’m trying to suggest that the main problem with self-publishing is perception. On both sides. As it’s one of my favourite things to do anyway, let’s take a music analogy. It has long been the case that unsigned bands put together demo tapes. Initially, this was so they could send their work to record labels and try to secure a contract. In recent years, there has been more of a move towards them putting the work out for the public themselves. It is now relatively easy to put stuff up on Myspace, or even onto iTunes. You can burn a CD for next to nothing. Nobody seems to have a problem with this. This is music by unsigned bands. It’s either really good, and you can’t understand why they haven’t made it yet, or it’s terrible, and you listen to it and move on. There will always be some people that think they can play guitar when they know three chords, just as there will always be people who think they can write a great novel despite having a poor grasp of grammar, spelling and narrative. You can sample music before you buy it – you can sample ebooks before you buy them. For me, there is very little difference. The perception, however, is miles apart. I’ve read some great self-published stuff. I’ve also read some terrible self-published stuff. The majority of it, (including my own, I would like to hope anyway) falls into the ‘shows promise, this writer could turn out to be a decent one’ category. Not many people seem to see it this way. And maybe that is because a lot of self-publishers declare themselves to be ‘writers’ when, in the majority of cases, I would say they are not. I am not. They, and I, are still in the aspiring phase. We are the equivalent of unsigned bands. Unproven, as yet, trying to make a bit of headway with the tools available. This doesn’t apply to everyone – I know there are those that are set on doing their own thing, that realise their work is too edgy or alternative to ever get out there in any other form. I have a lot of respect for these people as they remind me of musicians who do what they do purely for the love of it. Yes, they want to be recognised for their talents, but if that means playing to a room of twenty people rather than to a stadium, then that’s fine. In fact, playing to a room of twenty people is what we should all be doing anyway. If it remains at twenty, then that’s the way it goes. If it doubles, triples, grows into something else, then all the better. I think we have to be a bit humble about it, recognise the fact that readers are taking a chance when buying something, and recognise that the only way to stand out from the glut is to stand out from the glut. It doesn’t matter if I get up on a podium and try to tell everyone I’ve spent time on this book, I’ve worked and reworked and reworked it, I’m serious about it and haven’t just thrown some nonsense together. The reality is I am going to look, to all intents and purposes, just like Mason Power (the pen name of some bloke who just retired, read an issue of ‘Writer’s Magazine’ and decided the fantasy story he made up for his grandkids last week can be written down in one go and make him a fortune). I’m going to look like that until someone takes a punt and hopefully decides I’m not Mason Power. One person at a time, one step at a time – I don’t think there is any other way is there? Too right – the main cost of a book is time, not money. I’ll die with books unread, so why would I want to waste time reading bad ones? Indie or otherwise doesn’t matter in that sense. James, I seem to have managed to avoid some of the truly awful ones that people keep talking about. Have sampled a few total clunkers though, have to admit. How’s the Abominable Gentlemen going? Damn you, Neil, you’ve upset me by showing me that stupid ad. 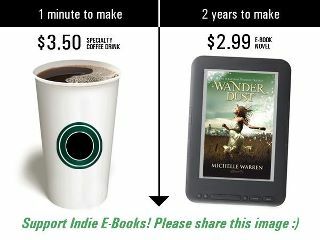 The only way you can “Support Indie E-Books” is by choosing them in preference to non-indie books. On principle. But only an idiot would adopt such a policy: “This may be a lousy book, but it’s an indie, so I’m going to buy it.” God help us. I once brought the wrath of God on my head when I made this point on a self-publishers’ website. Others saw something noble in buying indie books, and had no time for one who only wanted to read GOOD books without regard to how they were published. This ghetto mentality only encourages the majority of readers to gag at the very mention of indie writers. If I could read only indies or only non-indies for the rest of my life, I’d go for the latter, simply because of publishers’ selectivity. Fortunately, though, I’m at liberty to choose what I like. Why did you have to show me that ad, you jerk? What have I ever done to you? Bugger off, Neil, just bugger off. Iain, I thought you’d like that. I remember your ghettoisation comment from a previous conversation. And I agree. You can’t really support everyone who self-publishes on principle, that’s kind of like deciding to befriend everyone you see who’s wearing black socks. Supporting decent writers, whether self-published or not, seems like the more logical idea to me.